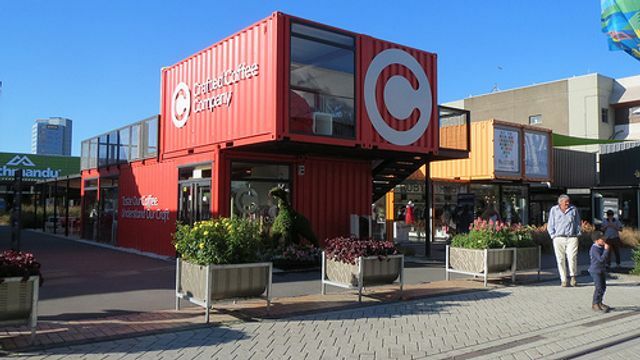 Are shipping containers the answer to sky high shopping centre rents? As Ireland’s economy begins to recover we are seeing the return of demand for space, high rents and key money within Dublin’s retail market. This contrasts with the situation as recently as two years ago when landlords not alone had to reduce rents but also had to offer rent free periods to attract tenants into their buildings. Increased competition between international fashion retailers to get a leasehold interest on a shop near Grafton Street or in the more popular shopping centres and retail parks is one of the main factors which has led to increasing retail rents in Zone A Properties. This asks the question of how smaller retailers are going to survive? Cleaveland, Ohio in the United States has come up with a strategy to support these small retailers – shipping containers. Landlords are recycling the containers for use as pop up units for small-scale businesses who can’t afford to rent larger, permanent units in prime retail locations. As the shipping containers are built to be able to endure the most aggressive weather and journeys at sea they are durable even when damaged or retired from shipping. The containers are being placed in the car parks of high profile locations shopping centres and retail parks so that they can avail of the centre’s footfall while paying lower market rents. The containers are compact with low refurbishment costs which ensure lower rents and overhead costs. It is not just America which has experimented with shipping containers – London has also gotten involved. English planners and developers have been using shipping containers as retail incubators – low risk homes for new concepts or online businesses testing a “brick and mortar” format. However the containers aren't a perfect solution for all small scale retailers. Depending on the project, they can require extra insulation to buffer against extreme heat or cold. If they've been used to transport hazardous materials, they might need extensive cleaning. And developers can run into challenges with planning and building regulations, since containers for human habitation are still a novelty.